Well there you go, I found our original email exchange and it was almost a year ago that I first arrived at PHPT not even knowing that Pilates was a thing. After a bout of acute sciatica caused by a slipped disc I’d been told by the physio that I would probably have to forget about long distance running and should do something to address the muscular imbalances in my body. That’s not what I wanted to hear as I was in the early stages of a multi year plan to compete in some of Scotland’s longest trail races. I wasn’t in the least bit interested in doing anything other than running but I had to do something so decided to try this thing called Pilates. You told me at the initial consultation that you’d teach me to use my core strength to run – I didn’t believe you for a moment but I had the words of the physiotherapist ringing in my ears so I went along with it. 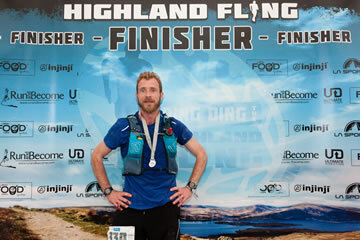 Fast forward twelve months and I’m in the best shape of my life and have just completed one of Scotland’s iconic ultramarathons, the 53 mile Highland Fling race. I knew before the race that I was well prepared. I’d put myself through a five month training cycle, starting in late November with a 35 mile week and building myself up to the point where a 50 mile week felt easy by February. With a solid base of 50 miles per week, I set about increasing my strength and pushing the boundary of weekly mileage ever higher. The strength phase for me meant that I was spending more time running uphill and more time running at a threshold effort, as opposed to the mainly easy effort running that I’d done during the base phase. One extra, magical, ingredient was the training I was doing in the Pilates studio. You do a fantastic job of understanding my goals and objectives and ensuring that the Pilates training is properly targeted to acheive them. I also benefited hugely from the strength work that we did using TRX, kettlebells and barbell, which was perfectly targeted at what I was trying to acheive. So I was definitely well prepared for the race, but it’s impossible to know beforehand if the preparation has been enough. I felt fit and strong but was still nervous as I tapered off my training in the final weeks before the race. It wouldn’t be enough of an achievement for me just to complete the distance, I didn’t want a death march in the closing stage of the race and wanted to run to the best of my athletic potential for the full 53 miles. It wasn’t going to be easy and there was an awful lot that could go wrong. My nerves and worries and self doubt all faded away when the starting gun went off at 6 am at Milngavie train station and I settled into a steady pace towards the back of the first wave of starters. The Highland Fling is a large race by ultramarathon standards, they accept 1000 entries and a little over 800 make it to the start line. The route is often narrow and would get congested, which is why the race starts in three waves a few minutes apart. It doesn’t matter which wave you run in as the event is chip timed but I’d joined the wave intended for people running under ten hours and sub ten was my goal. 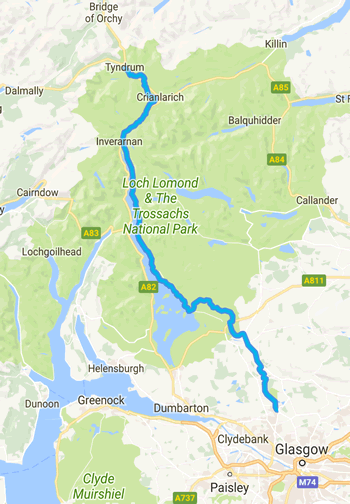 The first eight or so miles of the race are unremarkable as the route heads towards the Loch Lomond and the Trossachs national park. Then the first challenge of the race presents itself at Conic hill. I’d settled into a comfortable rhythm by this point and was enjoying the company of others around me. Ultra running is a lonely activity, it requires spending many hours of solitude preparing and it is quite magical finally to make it to race day and be in the company of other people who have been through the same thing to get there. I didn’t push hard up Conic hill but went at a pace that I knew I could sustain, based on my heart rate. This was the first point at which a year of Pilates made a difference to my ability to race. I was faster than the people around me and was gliding past them as we made our way up the rocky path. Running uphill requires good aerobic fitness and conditioning of the legs, which I had from all the miles I’d run over the winter, but is also helped greatly by the strength, posture and balance that I’d learnt in the Pilates studio. This allows me to run in a way that protects the smaller muscles in my legs by driving from the much larger core muscles whereby delaying fatigue and moving in the most efficient way to conserve energy. Once over the top of Conic hill my race plan really kicked in. I knew I had the fitness for a ten hour effort but also knew that I would need to preserve my body as much as possible in order to ensure I was as strong as possible by the late afternoon (it was still only just breakfast time for most people). Downhill running is hugely damaging to the body and I had planned to take the downhills very gently and managed to resist the temptation to fly down the hill as many others did. I was being passed by a lot of runners who had clearly started in the second wave but I stuck to my plan and was pretty much walking for the steepest sections. I’ve got enough experience to know that I would see most of the people passing me again before the race was over and it was going to be a long day. It wasn’t until the 20 mile mark, at Rowardennan on the banks of Loch Lomond, that I dared to believe my training was working and my confidence began to grow. I had 33 miles left to run and I knew I could do that fairly easily on fresh legs. As I mentally checked my body from top to bottom I was pretty sure I could run 33 miles on my not so fresh legs and I began to move up the field. Rowardennan was the second refuelling stop and I didn’t waste much time in filling my water bottles, grabbing energy gels, a pork pie and a bottle of Lucozade from my drop bag and setting off with growing determination. The route past the Loch is fairly runable for a while after Rowardennan but becomes increasingly difficult on the approach to Inversnaid, at which point it becomes very unrunable as you have to clamber over rocks, up and down steep gulleys and over large tree roots. I was very strong through this section and continued to move up through the field, spending as much time clambering with my hands as I was spending running. I passed countless people who were walking due to cramp and muscle damage from going too fast earlier in the race and knew that I was getting closer to my dream of a strong finish under ten hours. Finally I made it clear of the top of Loch Lomond and, while the fatigue was growing, I still felt strong and relatively free of pain. After a few miles there is a long uphill slog during which I continued to pass other runners. Some of the people I was passing were completely broken and would be suffering hugely to complete the race, but I was also passing people who were still running well but were simply more fatigued than me. Once again, the combination of huge aerobic fitness and core strength and engagement was working for me. I did suffer one low point about 49 miles into the race. Pain was starting to creep up my quads from above the knees and I was going very slowly downhill when a runner caught me from behind. 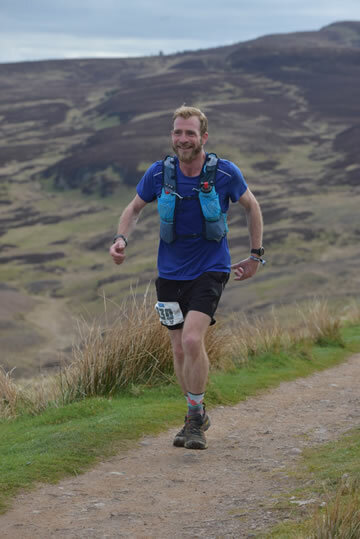 I’d been with this runner coming through the technical section near the top of the Loch and had left him behind after a few miles of running together. This was the wake up call that I needed to get out of the low point and race to the finish. The final four miles were incredibly tough, but this was it – the culmination of five months preparation and my chance to realise my dream and I simply had to dig in and get it done. I didn’t need to preserve my body any longer, I just needed to swallow the pain and draw on my remaining energy reserves to get to the finish. The two of us ran and chatted together, using each other to push to the finish and experiencing the rare delight of racing right to the finish line of an ultramarathon race. I beat him by five seconds, which doesn’t sound like much but felt like an eternity at the time. 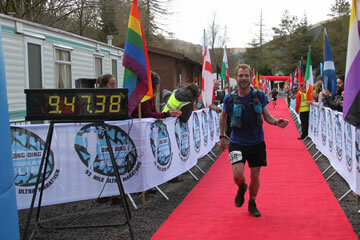 I’d made it from Milngavie to Tyndrum up the West Highland Way footpath in a time of 9 hours, 47 minutes and 25 seconds. Hill walking guide books recommend three to four days to hike it. I can’t describe the delight and elation that I felt to be at the finish and to have achieved the goal that I’d worked so hard for, and dreamt of for so long. The physio was wrong, I can run ridiculously long distances and you were right, Sabrina, I do it with my core strength. Thank you.